Who would have thought Georgia could make wine? I only thought peaches, pecans, and peanuts were literally the only crops that Georgia could successfully produce. Do not get me wrong - the Georgia wine industry still has a long way to go, but it is definitely a potential competitive market in American wine along with other pioneering states such as Virginia and New York to compete with some of the experienced veterans, Washington, Oregon and the ever-famous California. 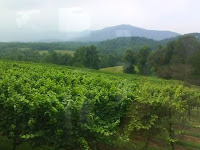 The Wine Growers Association of Georgia is a relatively recent organization dedicated to promote and support Georgia vineyards and wineries, most of which are in the North Georgia Mountains. 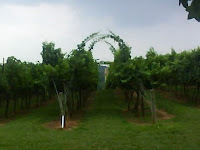 Currently eight locations meet the requirements in being “official” Georgia vineyards which produce grapes and fine wines while four locations are labeled as “up and coming”. 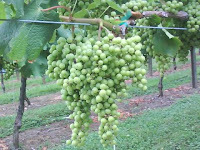 Some locations distribute grapes more than fermenting wine, but most of them open to the public for wine tastings, special events, and product purchasing. I visited three out of the eight leading locations: Blackstock, Frogtown, and Wolf Mountain. All three are nestled in the same neighborhood off of the Georgia Wine Highway. I felt like I was in a completely different world while being exposed to the small mountains, villages, and farms, and each vineyard alone was like a mini oasis of civilization providing their own local “water”. One of Georgia’s oldest wineries, Blackstock winery has been in business for over twenty years serving the local community. Blackstock focuses more on harvesting grapes and distributing them to other wineries. They do serve and sell their own wines on site and at various locations but not as much as distributing grapes. They are also a useful location for educational information about wine in general. The vineyards and grapes looked gorgeous: ripe, supple, and full of color. Their property alone is perfectly suited for special events and weddings. 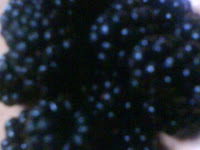 As for the wine, however most blends tasted quite weak and did not have much versatile body. The only wine I could particularly note was a White Merlot, and I am generally not a Rose fan. Overall: Beautiful location, takes great care of their produce but room for improvement in their own wines. These wine producers know what they are doing. They seem to have a lot of how-to knowledge when it comes to marketing their products. Located only a few minutes away from Blackstock on the Wine Highway, this sleek, selling-savy winery also harvests their own grapes as well as receiving Blackstock’s grapes for their own specialty blends. I personally enjoyed their red varieties over their whites such as the Propaganda Bordeaux and the Norton. Frogtown also serves lunch and dinner but do not expect too much. As fine as a winery Frogtown is, the service is not quite up to par as their wine tasting service and have some room for improvement. 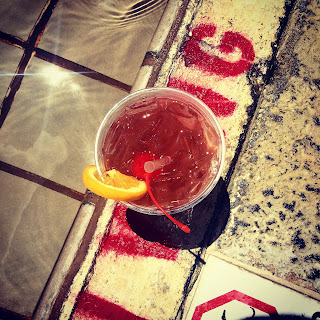 For instance, their Sunday brunch is over-priced with $35 per person plus gratuity and tax. I am normally used to the same quality level of service and food for at least ten dollars cheaper in New York. Despite the need for improvement in the dining department, Frogtown performs an exceptional job of marketing to its consumers. One can join their wine club at no cost but for three bottles of wine of your selection every quarter in addition to free samples of wines yet to be released and purchasing discounts. Overall: Good quality of wines and smart branding of products in general but need to improve their dining service if they want to continue it. This fantasy wedding destination lies on a rather steep hill off of the Georgia Wine Highway. Wolf Mountain is a winery, vineyard, restaurant, tasting cellar, and special event venue that can accommodate up to 200 guests at one time for any special event. Competition for fall weddings at this location must get brutal. Wolf Mountain serves a very tasty, elegant southern all-you-can-eat brunch for about $30 per person. After all, we are in the south and it would not be southern if it was not all-you-can-eat. If you can fit dessert into the mix, do try the chocolate covered strawberries if they are in season. A notable wine to try is the Plentitude, as it was the only wine I tried that tasted beyond its cost of $17.99 per bottle. 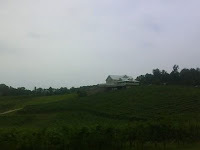 The wine tasting cellar is definitely worth experiencing as it also provides a picturesque view of its vineyard and the North Georgia Mountains. Overall: Definitely the most “talented” wineries thus far. Great brunch and try the tasting too if you have room. I plan to visit the others later this fall, but in the meantime I recommend checking out the Georgia Wine Growers Association. It is a useful resource to most Georgia wineries as well as additional locations where you can enjoy Georgia wine. I believe Georgia has a little more to work on when it comes to wine quality and versatility, but it definitely has the potential to become a domestic competitor in its future. I was planning to visit a farm this weekend in a more remote part of Georgia, but due to lack of transportation I had to postpone the trip for another date. In addition, I did not have all the details of my trip as planned out so now I plan to travel the following weekend instead. Good thing I postponed the trip. I found more farms and more produce that I did not think Georgia produces. I am so curious as to see what I Georgia fig would be like or a scuppernong. I even re-discovered Georgia peaches this past weekend and am determined to see its origins.